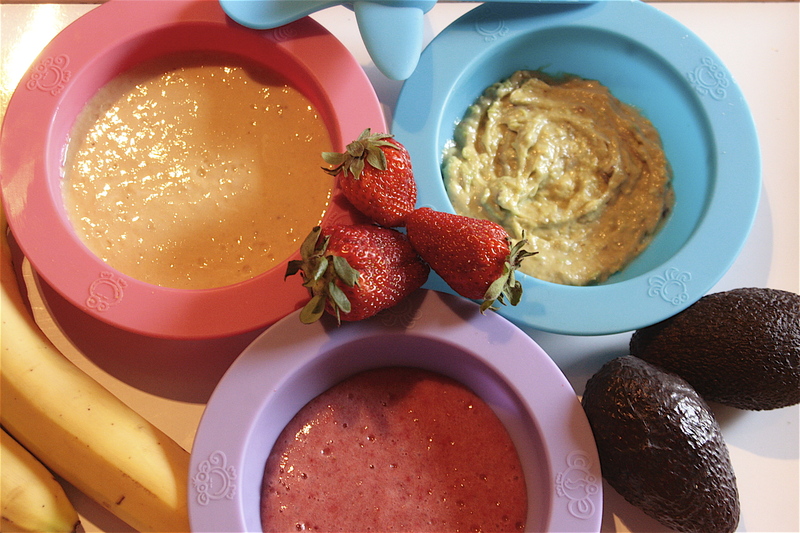 Here’s some super-fruity super-healthy and super-yummy first purees all using my personal super food, the humble banana. Bananas contain three types of natural sugars which when combined with their fibre content give an instant and sustained energy boost. They are also high in iron and potassium, the latter being thought to boost brain power. Bananas are wonderful for babies and one of the very few natural convenience foods that can be eaten by babies without blending or cooking, and can be eaten from day one of weaning. They’re also a great natural sweetener and perfect to combine with less sweet fruits instead of adding sugar. 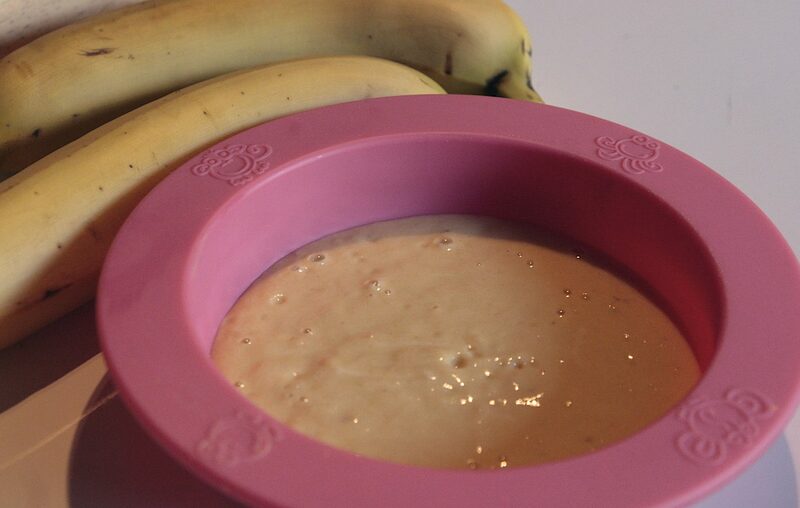 Bananas can be simply mashed raw with a fork and fed to your baby like this or with the addition of a spoon of creamy yogurt or made up baby rice you have something a little more substantial. 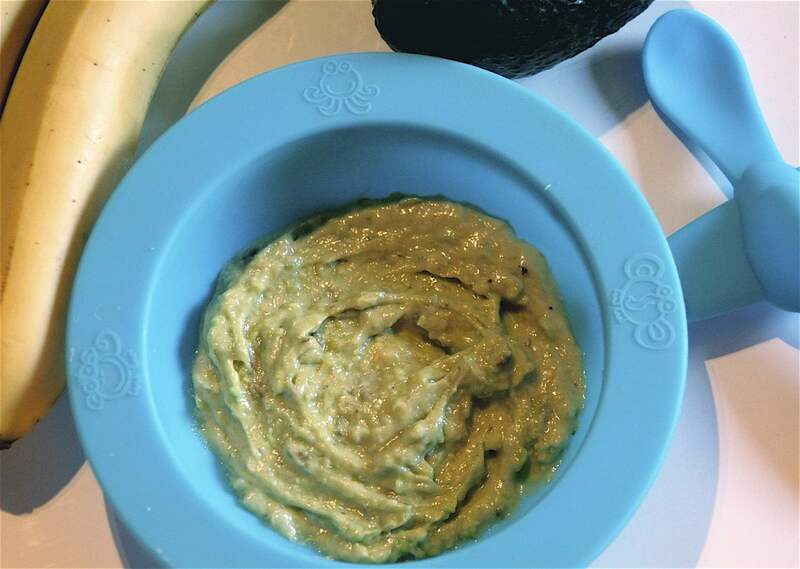 Most babies adore anything with bananas and these three recipes were my own two little babies’ favourite purees. With the exception of the Banana & Avocado puree which can be simply mashed, my recipes today do actually require some blending due to the additional ingredients. If you don’t already have one invest in a stick blender, baby blender or a Baby Bullet, they’re totally wonderful for quickly and easily whizzing up baby food. All three purees produce one serving. Unfortunately banana based purees do not keep well and are not suitable to be made in advance. What a combination for little tums? Super powering banana and super nutritious avocado together creating a super calorific double dosing of brain boosting potassium! Now isn’t that what all babies need?. And this is ooooohhhh so simple, and great if you happen to be out and about without a blender. Place the two together and mash very thoroughly with a fork OR whiz up with a stick blender, baby blender or baby bullet for an ultra smooth and creamy puree. Serve immediately. Strawberries are a wonderful source of Vitamin C, the B Vitamins and K and are high in ‘phenols’ that protect the body from diseases like cancer. Advise used to be to not feed babies strawberries for the first 12 months because of the potential of allergic reaction. However guidelines in the UK and US have dropped this to 6 months although parents or babies with any pre-existing allergies or history of allergies, or babies with asthma or eczema should be extremely cautious in the first year and seek medical advice before offering strawberries or other potentially allergenic fruit like kiwis, raspberries or citrus fruits. 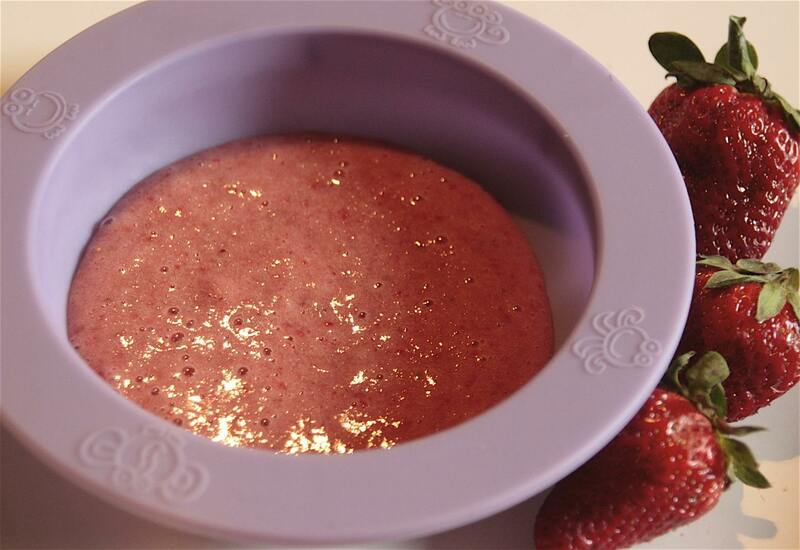 Place the banana and strawberries together and whiz up with a stick blender, baby blender or baby bullet. Serve immediately. Mango’s are another great first baby food, and are very unlikely to be snubbed by little mouths. They contain oodles of vitamins A & C, E & K as well as Vitamin B6 and potassium. And you can’t beat adding a little rich and luxuriously creamy greek yogurt to a purée. Place the banana, mango and yogurt together and whiz up with a stick blender, baby blender or baby bullet. Serve immediately. Have you seen my other weaning recipe’s….. Sweet Potato Daal for Babies, Two First Pasta Sauces, Bejewelled Eggs or my 5-a-Day Pasta Sauce? This entry was posted on Tuesday, May 8th, 2012 at 9:27 am	and tagged with Banana and posted in Baby Foods & Weaning. You can follow any responses to this entry through the RSS 2.0 feed.